Yesterday I called out Jen's mother for passive-aggressively texting Jen to say I should post less about beer and more about the babies. In yesterday's blog entry I offered her a $100 reward if she could spot the hidden message in my beer review because I believed she was not even reading them. Unfortunately for her she found the reference. Unfortunately for her I am not a man of honor and will not fulfill the promised reward. 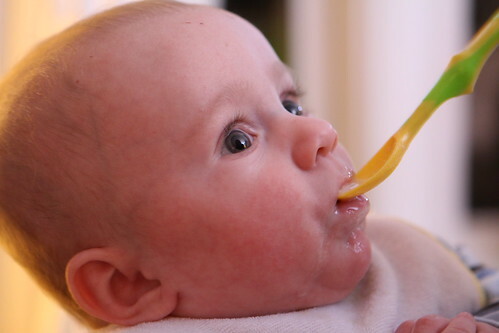 I will, however, deliver a blog entry that is chock-full of baby pictures. Jen was annoyed because I made us wake up extra early, before the sun, so that we could beat the traffic. Last year we were stuck in horrible traffic and I wasn't going to let that happen again. First thing we had to test Jen's ability to wear both babies simultaneously. Since a tree needed to be cut down we figured it would be best for me not to wear one of the babies while doing so. We found that the first run with Elliott on the back was not a big hit with him. When we switched Martin to the back we had success. This isn't to say that Martin liked it but he tolerated it. A couple of hours later we arrived at the farm where it was freezing cold and after bundling them up in their Tanooki suits we fastened them to Jen and made our way to examine the trees. I had it tough too. I had to carry this saw. Elliott seemed to really enjoy being carried this way. Martin, on the other hand, did not really enjoy his time as the caboose. 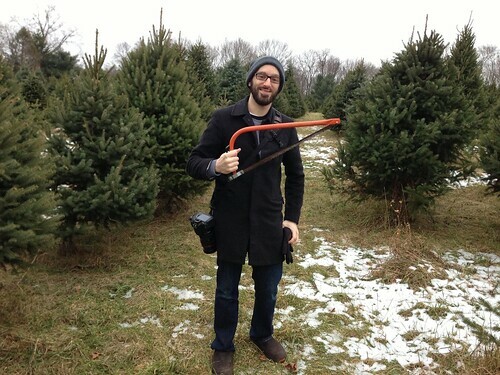 After finding a tree I began to cut it down and realized I didn't have it quite as easy as I thought. Normally the saws they hand out cut through tree trunks like butter. This tree, I suspect, had an adamantium core. 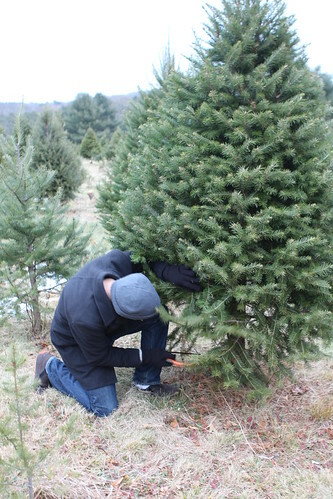 Eventually I got a firm plant with my foot so that I could push on the trunk as I cut. 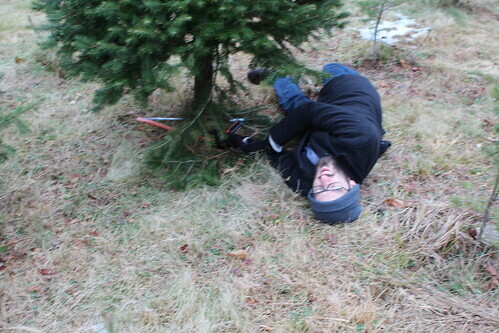 After a quick nap Jen woke me up and was kind enough to film me in the final stages of tackling this tree. Well, maybe it was a draw because I'm bruised and beaten. We even stopped by the market area afterwards to get cider and doughnuts. Jen posed with the Wombats in front of her favorite ox, Fred, who scared the crap out of her two years ago when we visited the farm. 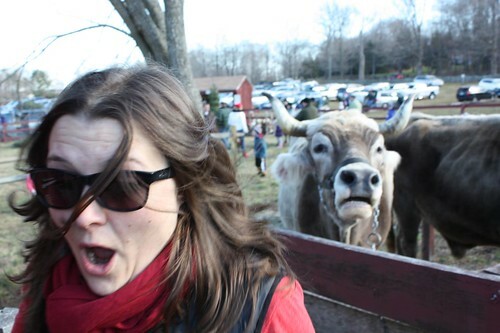 Just for old time's sake, here's a photo I got just as Fred lowed at her and startled her to her core. 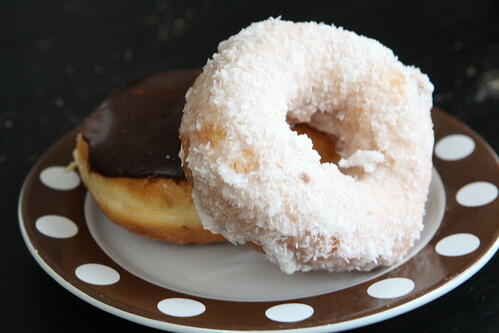 When we got home we enjoyed the rest of the doughnuts from the tree farm that we hadn't eaten in the car. When we took some child-birthing classes this summer the first class was plentiful with doughnuts. Jen was delighted with this. Leading up to the second class all Jen could talk about was how excited she was for doughnuts again. This time the teacher brought none. I don't think Jen absorbed anything that was taught at that class being far too upset about the doughnut situation. On the way home we stopped by Dunkin' Donuts to get her a maple doughnut but given that we aren't in New England the maple doughnut is not a guarantee and, sadly, she had to settle for a chocolate iced. It was the saddest day in human history. After the doughnuts we took a bit of a doughnut nap, each of us with a wombat of our very own. Jen got up just before me in order to capture our slumber on film. It was a great day of first and we continued the trends by giving the Wombats their first every solid food. 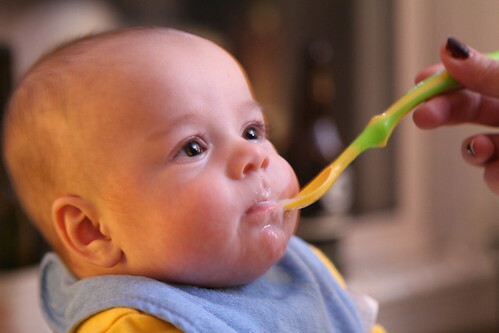 Well, they call it solid food but it's actually got nearly the exact consistency of breast milk. 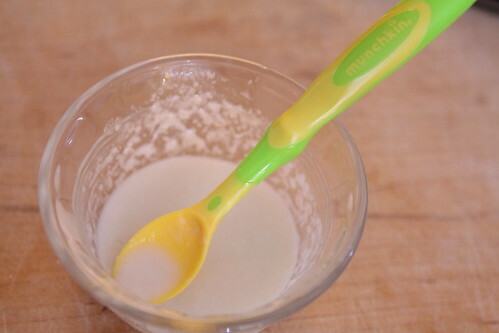 It's basically breast milk with a little rice cereal mixed in. And it's irresistible. Look how good that looks! We got nearly 8% of the food inside their mouths. The rest dribbled down their chins. All in all they did a pretty good job of it. 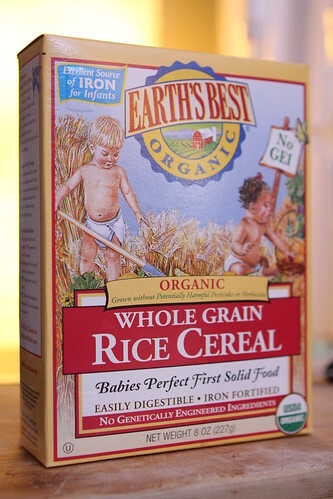 It just seems wrong that once they start showing an interest in the food that we're eating that we betray them by feeding them a nasty rice gruel. In case the pictures just weren't enough you can feel free to watch an incredibly stiumlating video of them eating their first solid food. 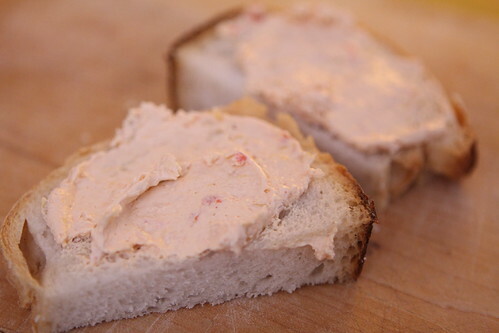 Mummy and Daddy enjoyed crab and artichoke spread on Italian bread shortly after their rice gruel adventure. I'd like to say I felt a little guilty but I didn't because I'm heartless. 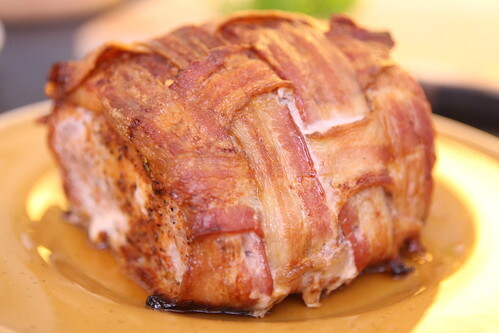 For dinner I made a pork loin roast which I seasoned with a barbecue rub and wrapped with a lattice of bacon before throwing in the oven. It feels a bit obscene to wrap an animal's meat in another portion of an animal's meat. We quickly got over that after tasting how delicious this roast was. I don't think I'm ever roasting a pork loin again that is not wrapped in bacon. 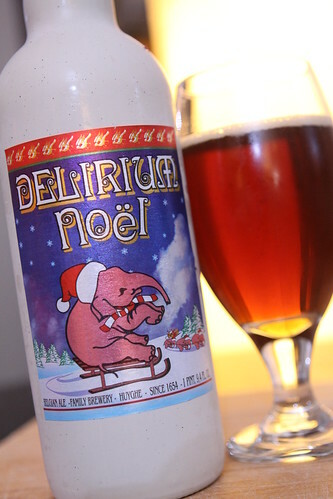 For beer we kicked off our Christmas season with this Delirium Noël from Brouwerij Huyghe in Belgium. I had bought this beer last year but I was too scared to drink it after discovering a huge amount of chunky gray clumps of sediment in it. I have long regretted it so this year I snatched up a big bottle and poured it out carefully. There was no visible sediment, at least in the top of the bottle, and the beer was fantastic. If I had another glass in front of me with giant chunks of human flesh floating around in it I'd gladly drink it. I might just pass it through a sieve first. The Wombats spent a tremendous amount of time just lying on the floor and admiring the tree. 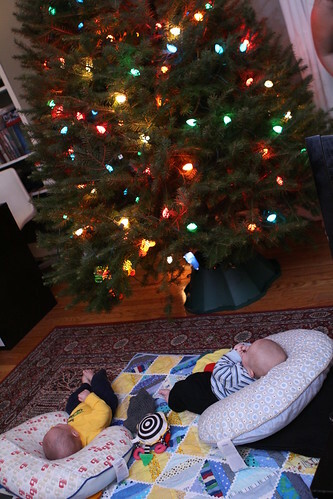 We hadn't gotten around to putting anything on it but the lights but they were transfixed by it. Judging on how much it kept them quiet we are contemplating just leaving the tree up year round. 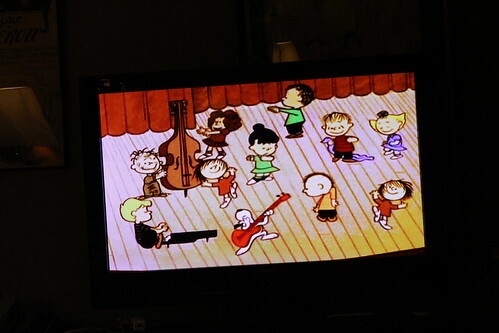 After dinner we started off the 2012 Christmas Season with the A Charlie Brown Christmas. Jen never watched this growing up but to me, you can't have Christmas without this depressing children's special. I don't think I understood just how depressing it was as a child so I'm willing to look past how depressing it is and just enjoy the nostalgic warmth that it radiates through Lucy's torment of Charlie Brown. We haven't really been letting the guys watch any television so they may not get to watch too many more Christmas specials. Let's face it, neither will we. Most nights we can barely squeeze in twenty-two minutes of a TV show before I pass out on the couch. Too bad. I was really hoping to watch 12 Men of Christmas with them this year. If you are Italian on your Mother's side, then the Welch/Welsh must be from your Father! Christmas ferret -- ok, why not? bacon lattice -- OMG, did you come up with that idea? camera -- is that your camera? Glad you and your family are having a wonderful life. Thanks, Nick! The Christmas Ferret is an idea whose time has come. 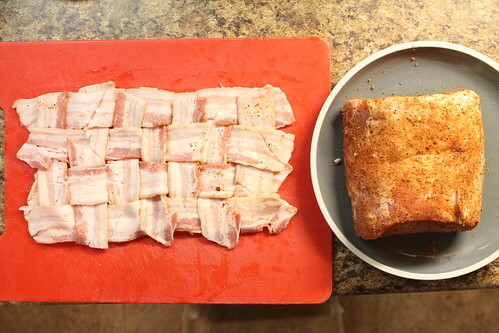 I didn't invent the bacon lattice but I wish I did. Thank you for the support on the beer pics. What camera are you referring to? Thanks for the wonderful words! Our life is pretty fantastic. We are very lucky.